ANGLO-SAXON. Eadgar. 959-975. AR penny. 1.74 gm. 19 mm. Reform coinage, circa 973-975. 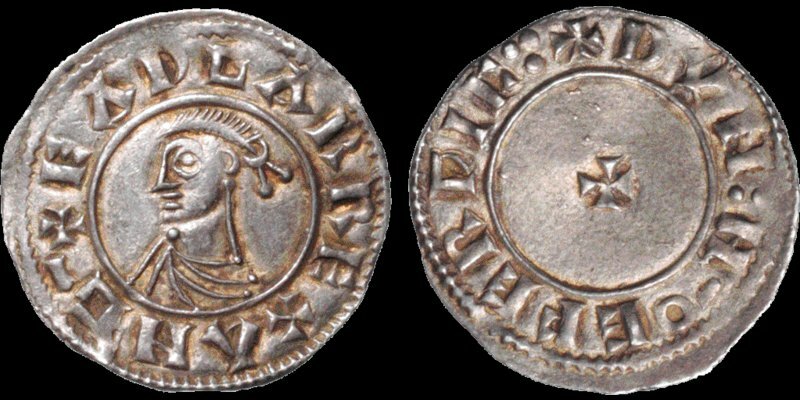 York (EFERWIC) mint, Dun moneyer. His diademed bust left; +EADGAR REX ANG— (Legend begins at 9) / +DVN: M—O EFERPIC around small cross pattée. SCBI 30 (American Collections.) 396 (this coin). Jonsson, York type A. (Jonsson records two coins for Eadgar of this moneyer at York.) S. 1141. N. 752. Extremely Fine; fine portrait; attractive coin with fresh, lightly toned surfaces. Superb example; extremely rare. Ex SCBI 30. American Collections. No 396. John Dresser.